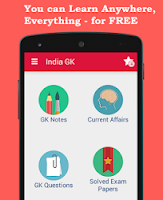 Current Affairs MCQs of 3 August 2015 Quiz: Current Affairs Daily Multiple Choice Questions (MCQs) for India GK, World GK and current affairs with Collection of daily objective type Question by www.Indiagk.net based on General Knowledge (GK) and General Science (GS) Questions for UPSC, State PSC, SSC, Police exam, Railway exam, SBI, Bank PO, IBPC, SSC, LDC, UDC, Army, Airforce, Navy, Coast Guard, Bank Clerk, TET and all entrance examination with current affairs News, Multiple Choice Questions (MCQs) available on Website www.IndiaGK.net and Android Apps with daily updates:. Which of the following companies has bagged the single-largest order of high mobility vehicle (LMV) from the Indian Army? Which indian player wins women’s squash title in Victorian Open WSA 2015 ? Which of the following companies has signed strategic agreement with Essar Oil to acquire its 49 percent stake? Lok Sabha Speaker Sumitra Mahajan on 3rd August 2015 suspended 25 members of which party ?